China prepares assembly of its space station, invites collaboration through U.N. 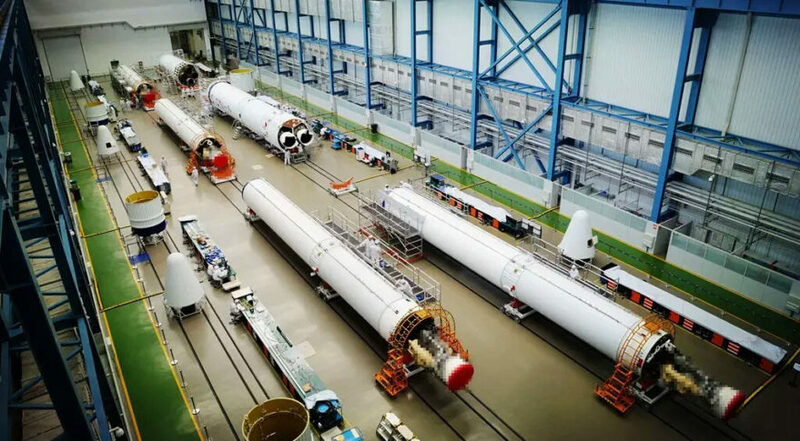 The China Manned Space Agency plans to make major strides on its space station in the coming months with the inauguration of a new spaceport with the launch of the first Long March 7 rocket, shown in production here. A precursor laboratory will launch in September, followed by a two-member crew in October. China said it would welcome international participation in many forms. Credit: China Aerospace Science and Technology Corp.
PARIS—The Chinese government has agreed to help finance non-Chinese payloads and experiments to be operated from China’s future space station through the United Nations as part of its attempt to internationalize the program, a senior Chinese space official told the U.N. The official said China is on track to inaugurate its fourth spaceport, the Wenchang Satellite Launch Center on Hainan Island, in the coming weeks with the launch of the first Long March 7 rocket. Wenchang is located at 9 degrees north latitude, which is the southernmost point on Chinese territory. Under the current schedule, a TianGong-2 orbiting laboratory module would be launched in September aboard a Long March 5B rocket to test technologies that will be needed for the space station. A manned ShenZhou-11 capsule is set to launch in October, carrying two astronauts, to rendezvous and dock with the TianGong-2 space station precursor facility in low Earth orbit. At cargo ship is scheduled for launch in the first half of 2017 to test in-orbit propellant refueling technologies. In 2018, the core module for the future station — described as a “test core module” — will be put into orbit. In-orbit assembly experiments will be conducted before the station’s two experiment modules are launched, by Long March-5B rockets, from Wenchang. Full operations are scheduled to start in 2022. Addressing the U.N. Committee on the Peaceful Uses of Outer Space plenary conference June 14 in Vienna, Austria, Wu Ping, deputy director of the China Manned Space Agency, stressed China’s openness to having non-Chinese experiments, payloads, astronauts and even complete space station modules become part of the Chinese facility. Wu said her office’s director-general, Wang Zhaoyao, signed two agreements with the U.N. Office for Outer Space Affairs (OOSA) Director Simonetta Di Pippo on space station collaboration and that China would use these to solicit, evaluate, select and finance future experiments from foreign nationals. A selection of experiments would need to be accompanied by a bilateral cooperation agreement between China and the nation proposing the experiments. “This is an exciting opportunity to further build the space capacity of developing countries and increase understanding of the benefits space can bring to humankind, including for the achievement of the Sustainable Development Goals. My office and I are looking forward to working with CMSA on these initiatives,” Di Pippo said in a June 16 statement. The agreements are dated March 31 but apparently were not announced until Wu’s speech to COPUOS. Wu pointed to existing agreements with the 22-nation European Space Agency and with Russia’s Roscosmos space agency on space station cooperation. ESA officials have said they are preparing their future astronauts for visits to the Chinese facility, although no specific agreements have been concluded. The Chinese space station will be comprised of three modules, the core command module and two experiment modules, orbiting at between 340 and 450 kilometers in altitude at an inclination of 42-43 degrees relative to the equator. The international space station, with the United States, Russia, Japan, the European Space Agency and Canada as partners, flies at approximately the same altitude but with an inclination of 51.6 degrees. The higher inclination allows it to pass over Russia’s mission control center in Korolev, Russia. Designed to operate for at least 10 years starting in 2022, with extensions possible depending on future maintenance requirements, the facility will house three full-time astronauts and up to six during rotation periods. The full-time crew will be rotated every six months. The CMSA is designing three types of unmanned cargo freighters, pressurized and unpressurized, which are to launch aboard Long March 7 rockets from Wenchang. Crews will launch aboard Long March 2F rockets from the Jiuquan spaceport, located in the Gobi Desert in Inner Mongolia. One of the distinguishing features of the Chinese facility, Wu said, is that it will be visited by a large-aperture astronomy telescope, designed to study dark matter, which will be able to dock at the space station for maintenance and hardware upgrades.